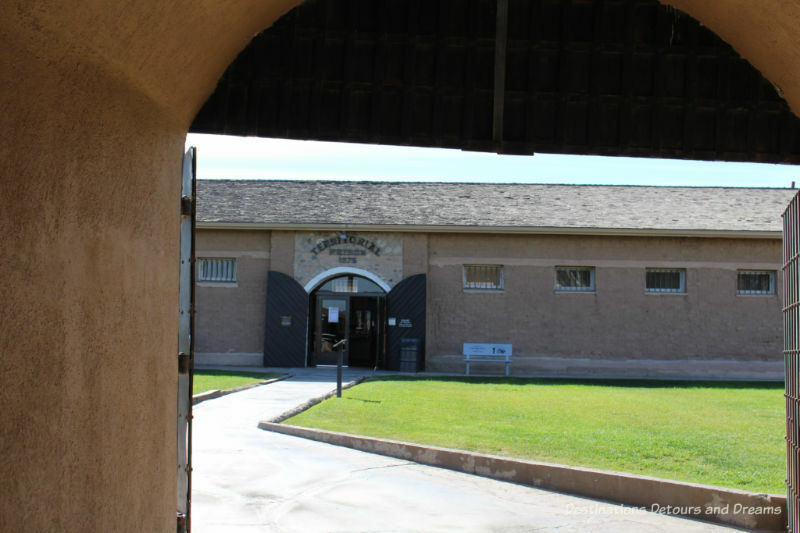 Yuma Prison Museum: Hell Hole or Country Club? 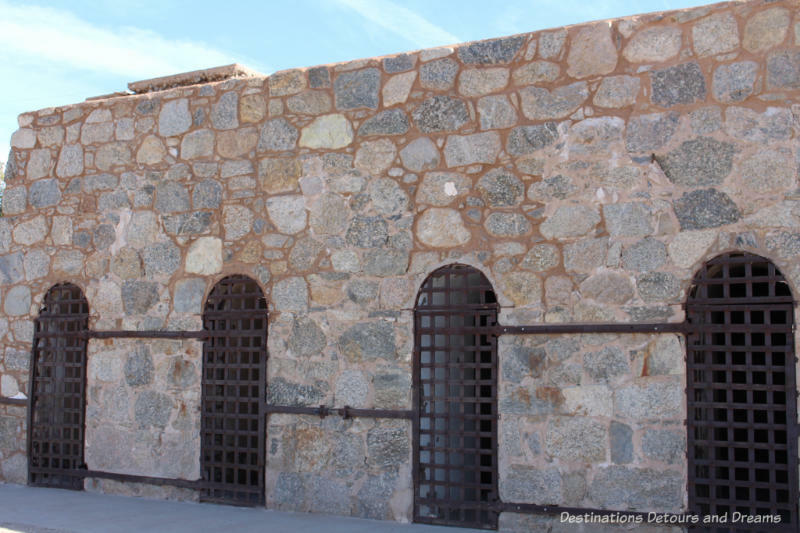 On July 1, 1876, the first seven inmates entered the Territorial Prison at Yuma, Arizona and were locked into cells they had built themselves. 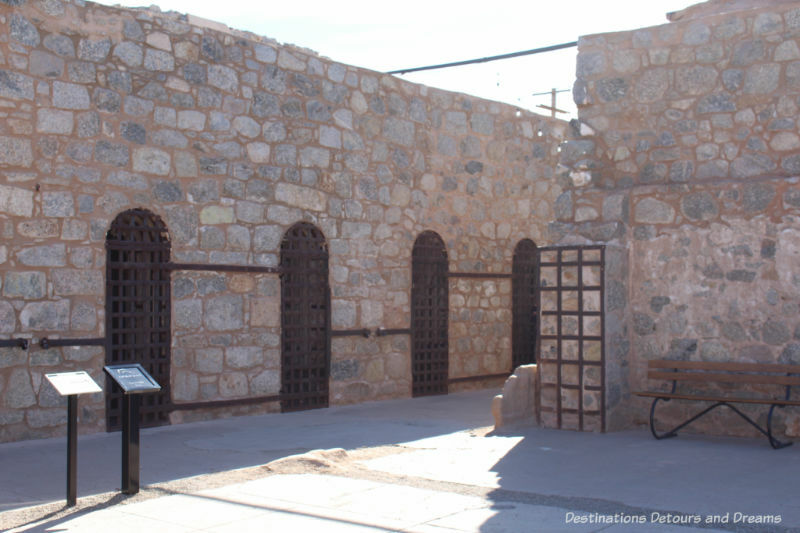 Thus began the legend of the Yuma Territorial Prison. By 1907, the prison was severely overcrowded and there was no room left for expansion on Prison Hill. The prison closed in 1909. Inmates were moved to the prison at Florence, Arizona. Today the site is a museum and a state park. 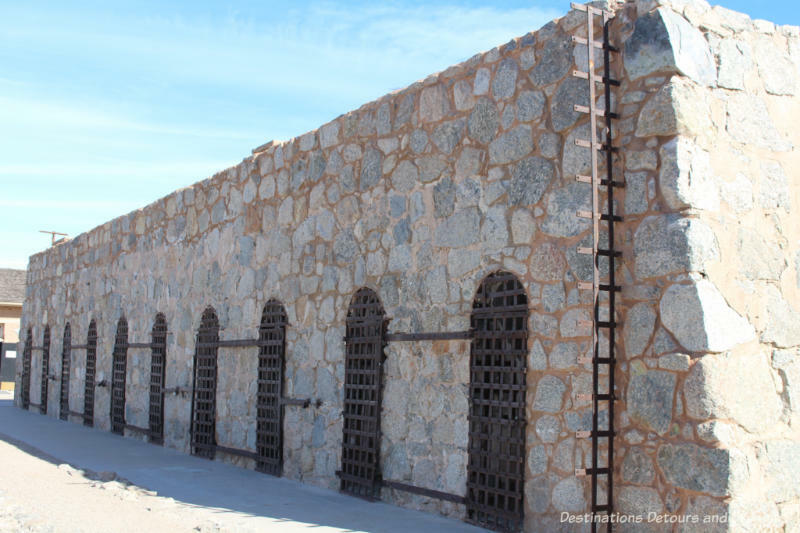 Visitors to Yuma Territorial Prison State Historic Park can view the remains of cell blocks, learn about the prison’s history and and catch an eerie glimpse into life at the prison. 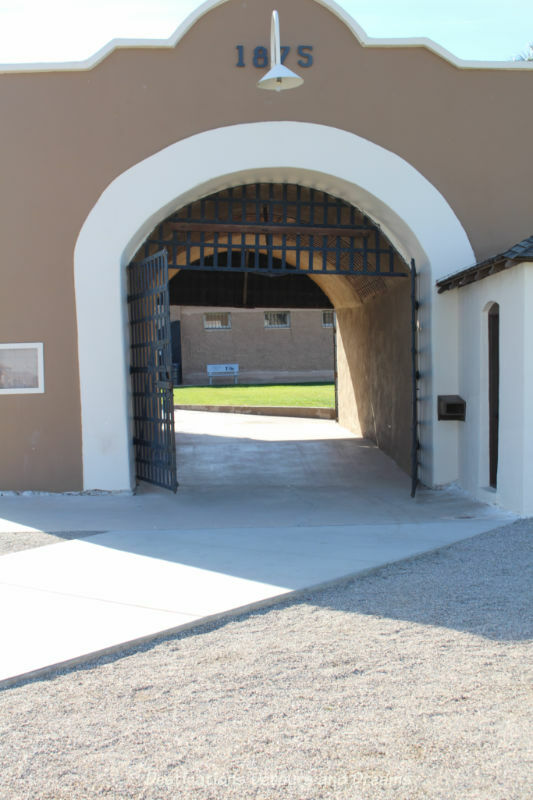 Sally Port, one of the last remaining original adobe structures of the prison, this facility served as the checkpoint through with prisoners entered and exited the prison. The museum building is not original to the prison. The museum building was built in 1940 with New Deal funds on the grounds of what once was the kitchen and dining hall. 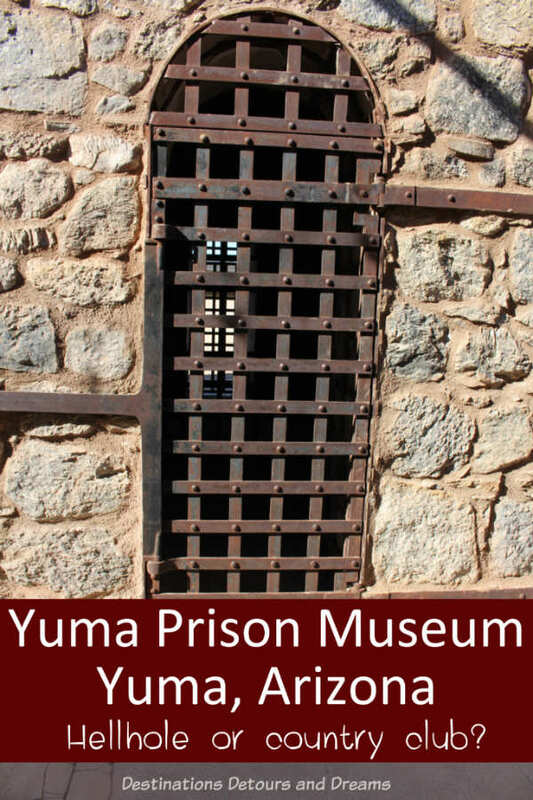 The City of Yuma operated the museum until 1960, when Yuma Territorial Prison became Arizona’s third state park. The Dark Cell, where prisoners who broke the rules were placed in their underwear. They were given one meal a day of bread and water. They were given no bedding. Restroom facilities did not exist. The only light was a small beam from a vent in the roof. 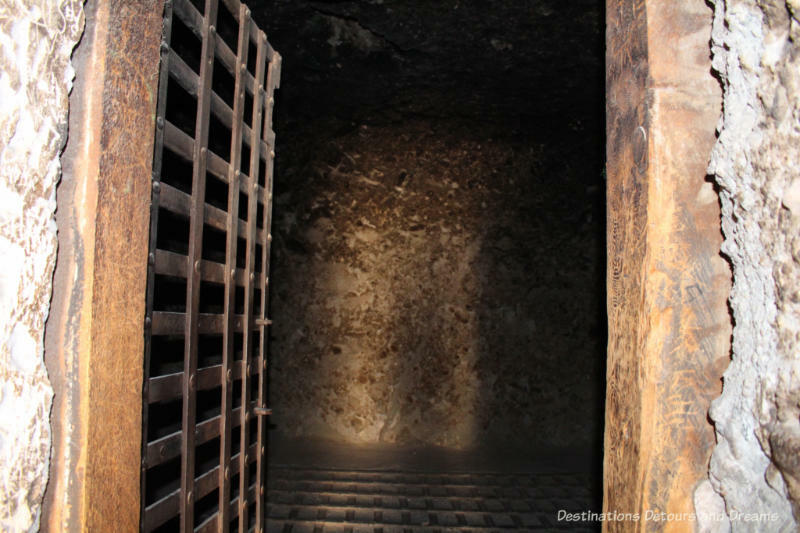 Convicts referred to the prison as “hell hole”, probably because of the dark cell. Yet, other accounts list the prison as humanely administered and a model institution for its time. An 1890 newspaper account said, “cells are kept scrupulously clean . 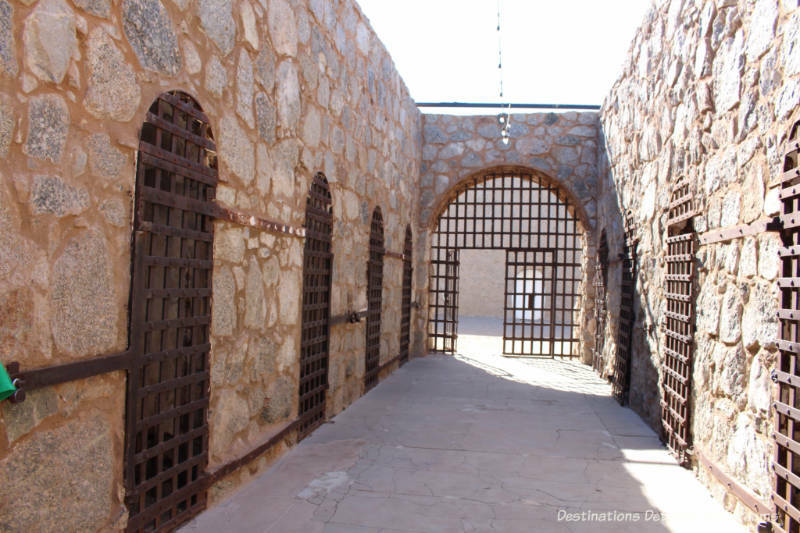 . . prison delightfully located on a hill overlooking the town and answering every need.” The prison had more modern amenities than many Yuma homes and Yuma residents resented that. Electricity, ventilation, sanitation facilities, a library and prison band caused some to consider the place a “country club”. Prisoners worked 48 hours a week in the fields, quarry, adobe yard, or assorted shops. In their off-hours, they were allowed to produce crafts. Crafts were sold at once-a-month craft fairs, open to the public. Profits were shared between the prison and the inmates. Water came directly from the river. In 1871 the water reservoir was built. Inmates dug tunnels at the base of the hill. The tunnels filled with water. From there the water was pumped into a holding tank, also constructed by the inmates. A platform was built on top of the tank to reduce evaporation. In 1882 a guard tower was built on that platform. 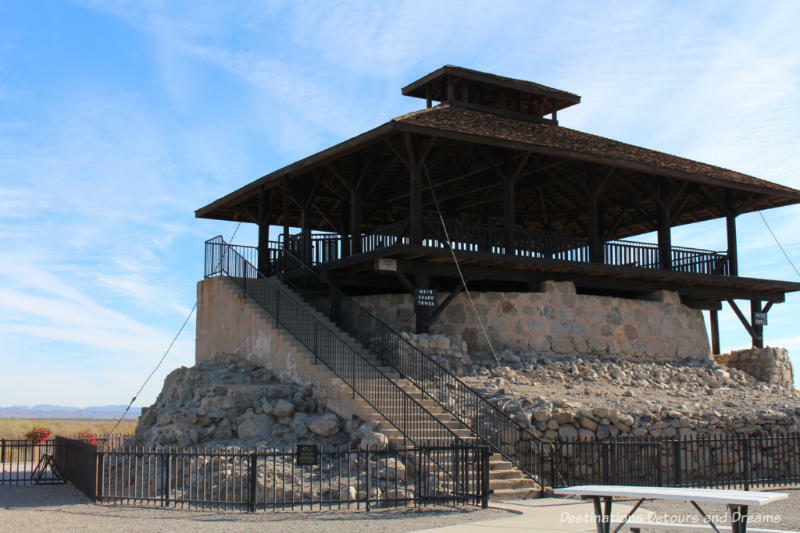 The guard tower became a civil defense lookout during World War II. Teens may sometimes refer to their schools as a prison. Those who attended Yuma High School from 1914 to 1918 could make that statement literally. The High School burned in 1914. Classes were held at the prison site until the new school was built in 1918. That was just one of the uses of the site from the time the prison closed until the museum opened. A county hospital was once housed in the Superintendent’s building. 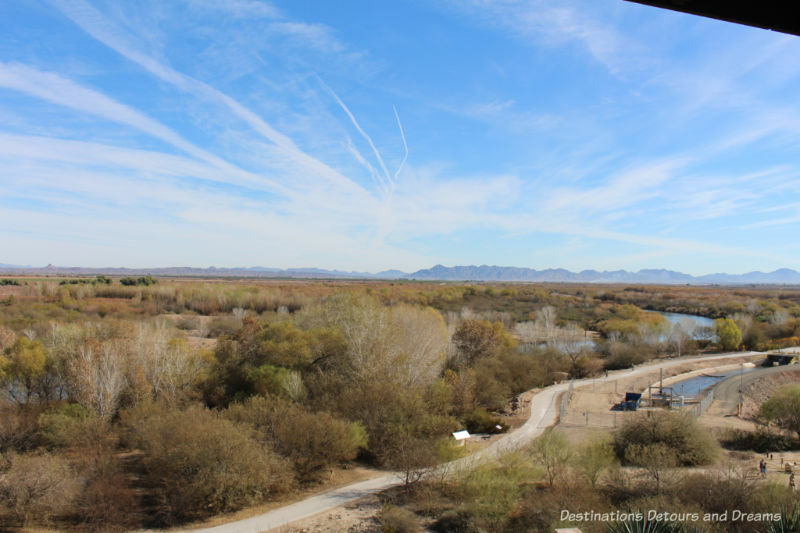 The site was used to help rebuild Yuma after the 1916 flood. Veterans of Foreign Wars used guard headquarters for years. Hobos found free lodging during Depression years. Townspeople used the complex as a free source of construction materials. 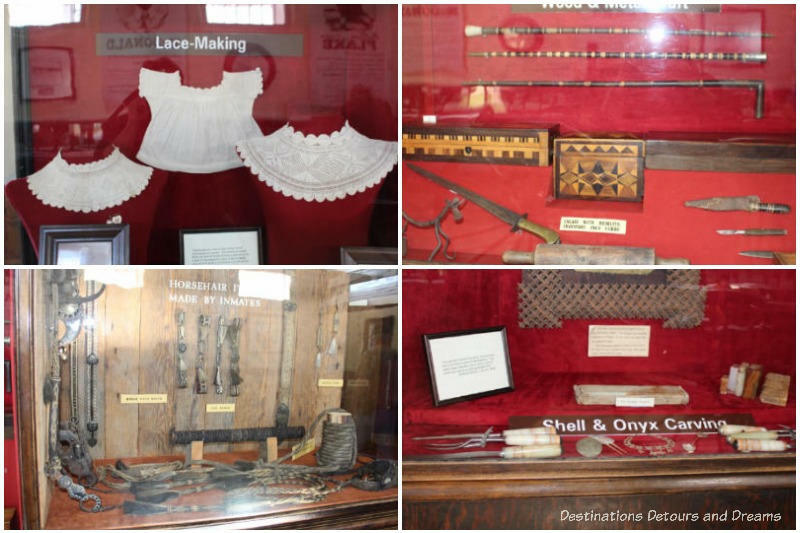 Today’s museum exhibits provide a glimpse into prison life at the time the prison was operating. The information on the prisoners and their keepers offers a broader look at the history of the time period. I found the site to be both thought-provoking and uncannily unsettling. I found myself wondering about what is and isn’t humane treatment of prisoners. The museum includes information about some of the darker sides of the prison, but the overall image presented is one of enlightened treatment. True or selective memory? Part way down the prison hill is a prison cemetery, where 104 of the 111 inmates who died at the prison are buried. (Families claimed the bodies of the other 7.) Some died violently or in escape attempts or workplace accidents, but the majority died of illness. Tuberculosis was a common culprit. 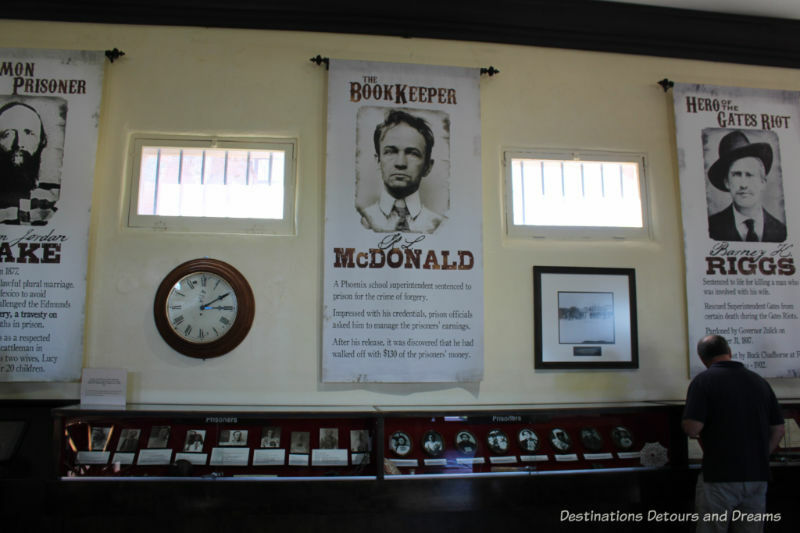 Have you visited Yuma Territorial Prison or another old prison? What did you think? How did you feel? Wow….I can imagine that it IS haunted Donna…but then I believe in those things! It does give the appearance that it was kept very clean. But no, I have never visited a prison. I can’t say that I have avoided doing so, but I guess it just never made the agenda on my trips! Interesting post! A prison wouldn’t be my first choice as a tourist stop either, but this park ranked high on the list of things to see in Yuma so I paid it a visit. It was an interesting perspective on history. I visited an old prison in a remote part of Colorado, not too long ago. I find your description of the area used and the methods of treating prisoners placed in solitary confinement to be undoubtedly inhumane. 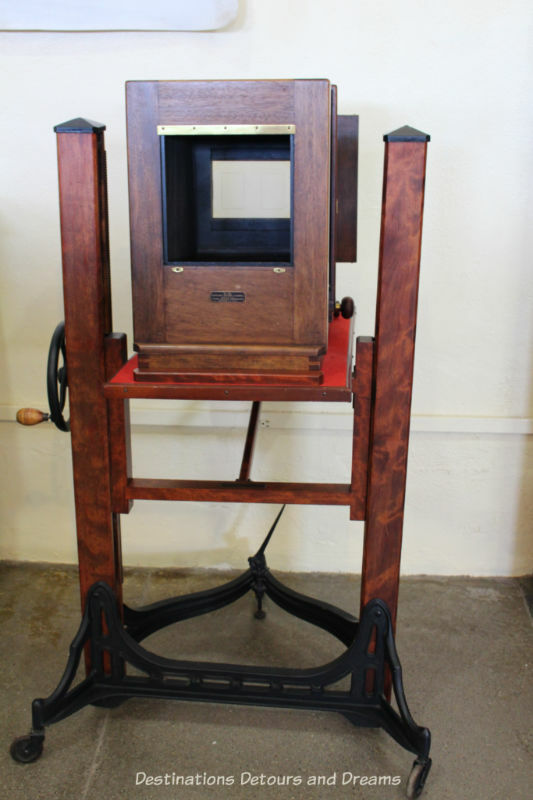 I love your photos, especially the one of the old camera used to photograph incoming prisoners. Thanks for sharing. I agree that the dark room was inhumane treatment. I don’t know for sure what “obstructing railroad” was, but I’m guessing that because the building of the railroad through the area was so important anything someone did that got in the way was illegal! 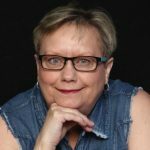 Hi Donna, wow I don’t know what would be worse… Bedbugs or trying to sleep on an iron bunk? Yikes. And I just love the language the prison is “delightfully” located on a hill. Lol bet the prisoners didn’t find it so delightful. I wonder if they made use of the hell hole for disobedient kids when it was used for a school? Wow that would have shaped kids right up. I imagine that would have shaped kids up but nothing in the material presented suggests any kind of treatment like that when it was a high school. The “delightfully located” phrase struck me as funny too – as if this was a resort. It is amazing how many old prisons have been turned into museums – an indication of our fascination with the darker side of history perhaps. 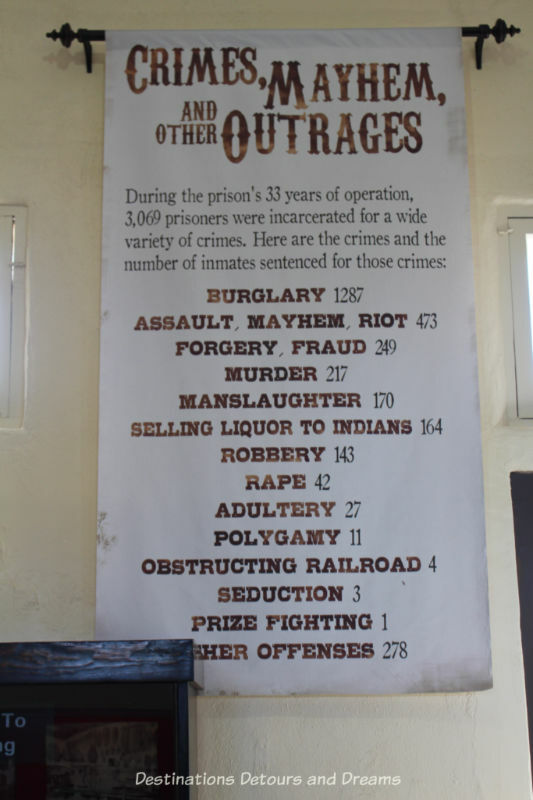 It is interesting to ponder why so many prisons have been turned into museums. It seems a bit odd when you think about it. Spooky, haunting and interesting are good words to describe the place. 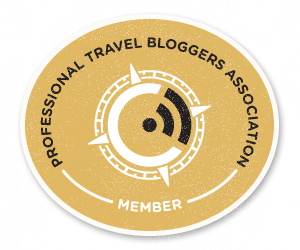 It’s funny how often I come across common themes in blogs I read. 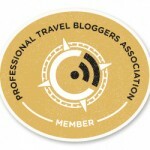 Makes you wonder what force is operating in the blogosphere. As human rights defender, I have been inside more prisons than I care to admit and always look them up if they are turned into museums. So you can understand how thrilled I am with this post. Great photography and this one is going on my list. Thanks. I think this may be the first prison turned museum I’ve visited. There was a lot of historical information, which I always find interesting, but it was also a little eerie. It is interesting they built their own prison and then later did the work to build the water supply for the prison. TheYuma High School mascot and their nickname is ‘The criminals’ – they are proud of that prison there! I read that in the displays at the museum. I guess they are proud of the prison. Eastern State Penitentiary in Philadelphia is an oft visited sight seeing venue in my home town of Philadelphia. We do seem to have a fascination with prisons/dungeons. Most visitors to San Francisco try to take a tour to Alcatraz and we hopped off our Hop On-Hop Off bus tour at Kilmainham Gaol in Dublin. When we visited Cape Town in October, Robben Island where Nelson Mandela was incarcerated was a must visit. 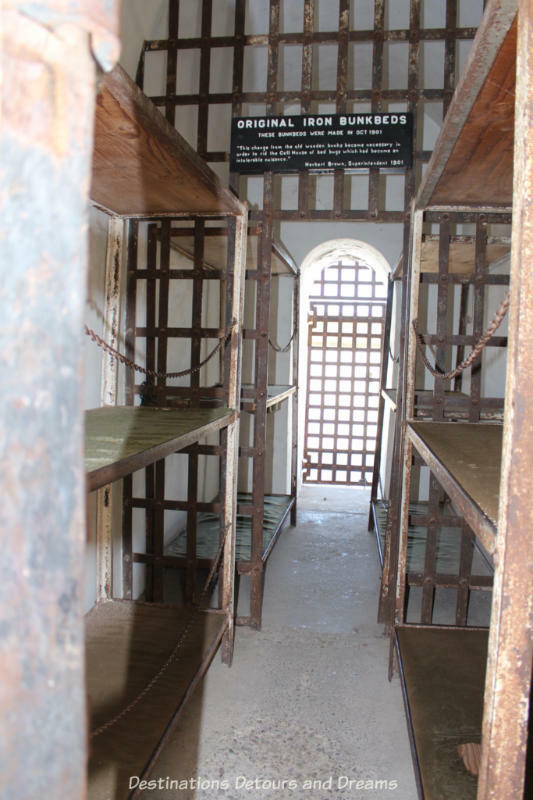 Typically, visitors are treated to a fascinating dose of history when they visit these places of confinement. I guess the fascinating dose of history is big part of the attraction. What people are put in prison for and how they are treated says a lot about the culture of the times. I agree that calling any prison a country club seems like a stretch. Wondering what those other offences were can get the imagination going. Those who thought the prison had the amenities of a country club obviously had not visited it as it definitely fits the convicts description of a “hell hole.” It’s not hard to picture the overcrowded conditions, the misery of the bed bugs and later on the iron bed as well as the heat from an Arizona summer. Imprisonment there would have been a sobering punishment. I certainly wouldn’t want to stay there. I can’t imagine what it would be like in the heat of the summer. The walls that surrounded the prison no longer exist but the stone walls of the cells show a solid architecture. I like the looks of the stone and steel together and enjoyed taking photos, but all the time I kept thinking about how awful it would be to be imprisoned there. It’s great that there have been efforts to preserve this piece of criminal justice history. 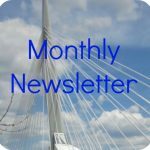 Thanks for writing about it! I was surprised at how much historical information was available in the museum. The prison kept meticulous records of the prisoners and there was a lot of information on individual prisoners and their life inside. I wonder if you were unsettled by residual energy. It seems like so many ghostbusting efforts take place on old prison sites. I find it interesting that 3 were incarcerated for the crime of seduction, and one for prize fighting. The glowing description in the newspaper article makes this place seem like a vacation resort! Thanks for sharing. I don’t know if I was unsettled by residual energy or not. It’s possible. It also could have been the very thought of being imprisoned here. It was only after I visited the museum that I read about some people considering the place haunted. I bet it felt good to leave the Yuma Territorial Prison that day! I’ve visited the Folsom Prison visitors center. Since that prison is still in use, you can’t go inside but you can get a bit of the story in the gift shop area. There was a sense of freedom upon leaving. Somehow it does seem a little weird for a prison to be turned into a museum. But they are part of our history and, unfortunately, we incarcerate far too many people for excessive sentences. We have more prisoners than any other developed country. It is a little weird and yet these prison museums do provide an interesting look at history. I always enjoy your histories of the places you visit. I haven’t been to Yuma Territorial Prison, but did visit Alcatraz. It was a weird feeling imagining the inmates who had spent time there. So the word weird has come up a couple of times in comments. I think it fits. This was one place I didn’t want my imagination to be too vivid. Whoa! Didn’t think of visiting this the two times we were in Yuma! I have to also try these posts of focused looks at a specific point of interest, rather than my general sweeps of a locale. You do a great job of them. Thanks for this detailed look at this unique State Park! You can probably tell by now that I love delving into the history of a place. 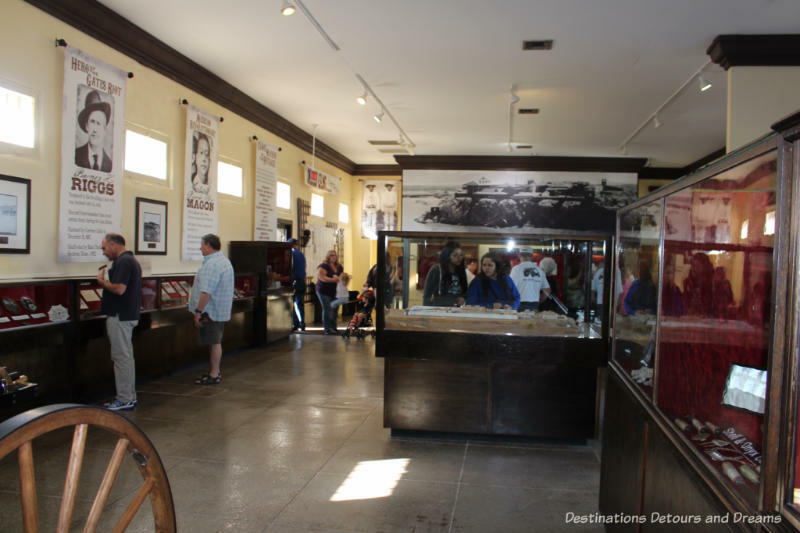 Even the term, ” Yuma Territorial Prison State Historic Park” is an oxymoron. But in terms of bringing people in to learn the history — a noble and necessary thing — it works! I was surprised at how much history there was at the park. I thought perhaps it just be a walk through old cell blocks. Great tour! I must say, I especially loved the tidbit about “teens calling their school a prison” but these teens actually got to go to school there for a while — very clever! I couldn’t help but think about what the teens at the time said about their school. I can certainly imagine some of the tweets and Facebook status today’s teens would make if their school was housed in a former prison. We saw the prison from the highway last week but didn’t visit, so thank you for showing us what we had missed. It was on our list of places to visit but to be totally honest we were pretty much worn out from seeing many museums over the past few months, one of those being Alcatraz in San Francisco. Hopefully if we are in the area again we will make a point of stopping in there, it sounds pretty interesting. I love museums, but can also understand reaching a saturation point. I haven’t toured Alcatraz, but I’m sure it is pretty interesting. What an interesting read! Learning how the lives of the inmates mirrored life on the “outside” with craft shows and normal jobs is fascinating. I’m sure there is quite a bit of “spirit” still around those grounds. Thanks for sharing this piece of history with us! There were certainly ways life on the inside mirrored that on the outside, but there was also some significant differences. The Dark Room for example. Yes, there is likely quite a bit of “spirit” on the grounds. So many prisons of the past were terrible places – it seems to be an area where we’ve become more humane and understanding. We have become more humane in some of our prisons, but I think there are still some pretty awful places to be incarcerated in the world. Such an interesting post! Old prisons have always fascinated me. Thanks for sharing this one! I wonder what it is about old prisons that so fascinates people.